So after over 15 hours and 1262 miles of auto racing, the Memorial Day Trifecta is complete. The Grand Prix of Monaco, The Indianapolis 500, and the Coca Cola 600 have passed us by. I watched all 3 events, and I noticed something that I’d been wondering about, and it really made me mad. As I discussed on Friday, this is the 50th anniversary of the implementation of Nomex as a material for driver suits. It’s one of the most important safety advancements in the history of auto racing. The 1964 Indianapolis 500 and the 1964 World 600 were the two races that helped bring the issue of fire protection to light. By 1967, three years later, Nomex would hit the racing scene, and has saved countess lives in racing accidents. You would think that at least one of the telecasts would discuss this at least once…but no. None of the telecasts discussed it. The only time it was mentioned was on a special during the weather delay in the Coca Cola 600, and all that did was to mention the crash and fire, and didn’t even discuss that it led to Nomex. Why is this being ignored? This is, again, one of the most important advancements in the history of auto racing, and this is the 50th Anniversary of it’s introduction. I could understand some of the telecasts during other races not talking about it, but the Indy 500 and the Coca Cola 600 not talking about it makes no sense. 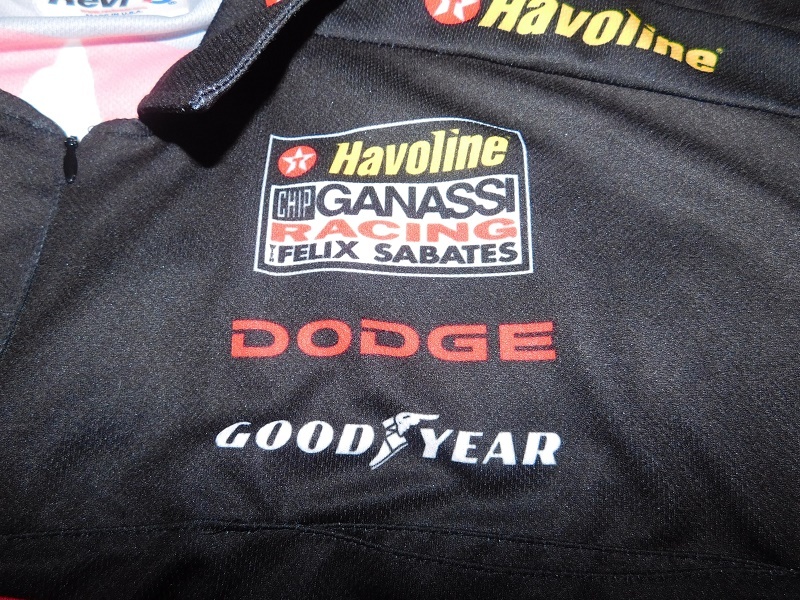 The HANS device, the SAFER Barrier, and the new designs of race cars are all important, but Nomex was the original driver safety advancement, and 50 years after being implemented, it is still the best material for driver suits. Sit back and think about that for a minute. In a world where technology is advancing to the point it’s impossible to keep up sometimes, Nomex has been the best material to make driver suits for 50 years. 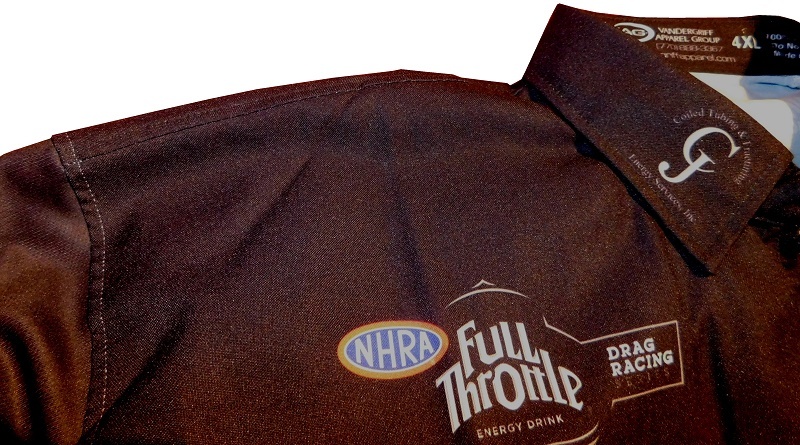 Granted, the newer Nomex is designed to be more comfortable, but nothing has surpassed it. With all the talk about auto racing safety in recent weeks, I would love to see a piece during a pre-race show about what Nomex is, and why it’s so important. I think the issue needs to be discussed, and I can only hope it will be discussed. Jamie McMurray #1 McDonald’s $1 Any Size Soft Drink Chevy SS-Same basic scheme as McDonald’s, same A grade. Brad Keselowski #2 Miller Lite Patriotic Ford Fusion-The scaled down look is good, the flag motif works very well. It’s a good looking car that isn’t over done, and I give it an A.
Ty Dillon #13 Geico Military Chevy SS-Same scheme as last year, same F grade. Kyle Busch #18 M&M’s Caramel Toyota Camry-The hood is a tad overdone, but it’s not that bad, and the side design looks good. Orange and blue can be a difficult color scheme, but the shades used work very well. I’m going to give this scheme an A. Gray Gaulding #23 Bubba Burger Toyota Camry–The new design can be described as “rearanging deck chairs on the Titanic.” While some effort was spent on the design, it didn’t improve at all. It’s still an F grade. Ryan Newman #31 CAT/Granger Chevy SS-This is a smooth scheme, with a great color scheme, and a great look, which will always earn an A.
Matt DiBenedetto #32 Reddit Ford Fusion-This scheme has a great color scheme, but the team felt the need to compensate for this by using a horrid design scheme, that is nothing but an over designed mess. It’s a horrible look, and not even a good color scheme can save it from an F.
Landon Cassill #34 MDS/#checkitforandretti Ford Fusion-Same basic scheme as MDS, same A grade. David Ragan #38 Dockside Logistics Ford Fusion-Same basic scheme as 2015 Dockside Logistics, same A grade. 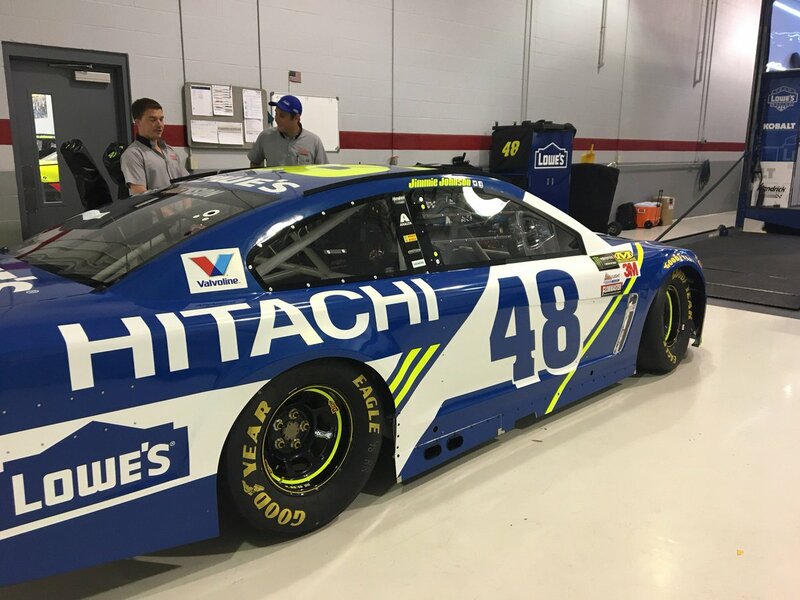 Jimmie Johnson #48 Lowe’s Patriotic Chevy SS-The toned down look is a good one here, and it’s worth noting that this is the best Jimmie has looked all year. I’ll give it an A.
Derrike Cope #55 Ckezepis Law Toyota Camry-Simple, smooth, and a great color scheme…what else do you need for an A grade? Memorial Day is a day to honor the sacrifice of those who paid the ultimate price keeping our freedoms free. Our servicemen should always be the focal point of Memorial Day. From Saratoga to Afghanistan, from Gettysburg to Vietnam, throughout the history of our country, our soldiers have fought for us, and will always be ready to fight for us. Never forget their sacrifice, and the sacrifice of their loved ones. Memorial Day is also known as one of the most important days in auto racing, with the Grand Prix of Monaco, the Indianapolis 500, and the Coca Cola 600. With the television contracts, and internet coverage, it seems a world away from 1964. 10 days in 1964 would set the ball rolling. 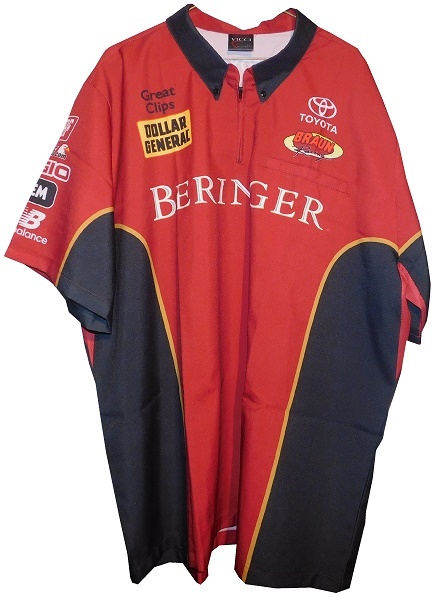 NASCAR had rules concerning “fire retardant” uniforms but these were inadequate at best. These uniforms were cotton coveralls traditionally used by workmen that had been dipped in a number of fire retardant materials including Borax. These were not only ineffective, but were extremely uncomfortable to wear. They were known for inflaming the skin, and aggravating asthma. 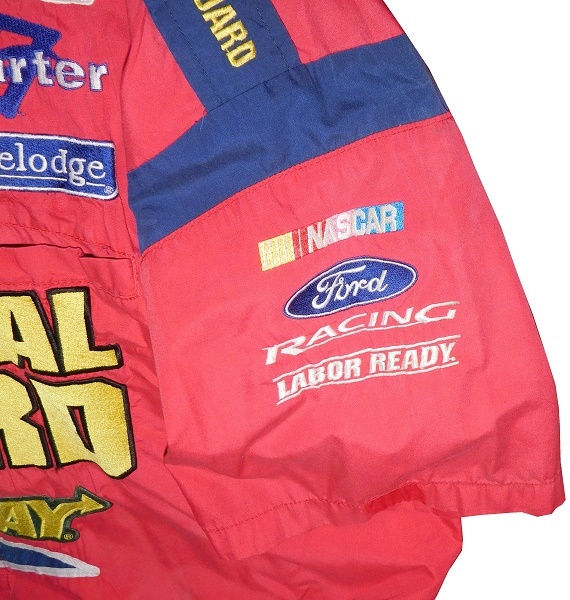 Fireball was not wearing these coveralls during that race, because he had a doctor’s note stating he should not wear them. There is some debate over what the doctor’s note was for, either for asthma or skin hives. 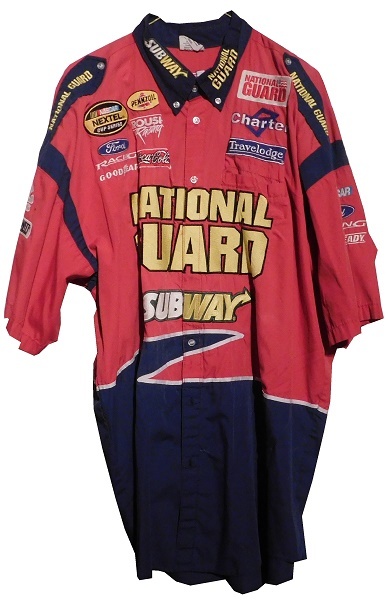 It illustrates why these uniforms were not popular, they were so uncomfortable to wear that drivers did not want to wear them. The writing was on the wall. 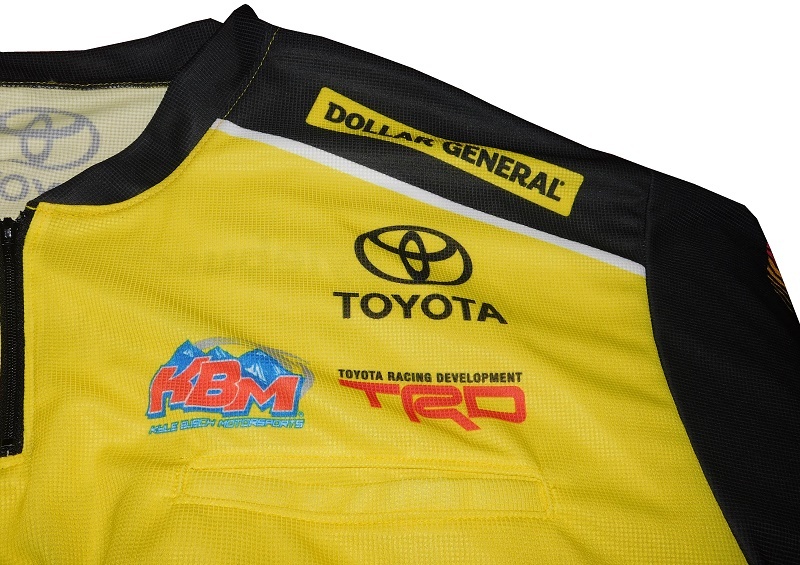 There needed to be a change in racing uniforms. A material needed to be used that would be either fire resistant, or fire proof. 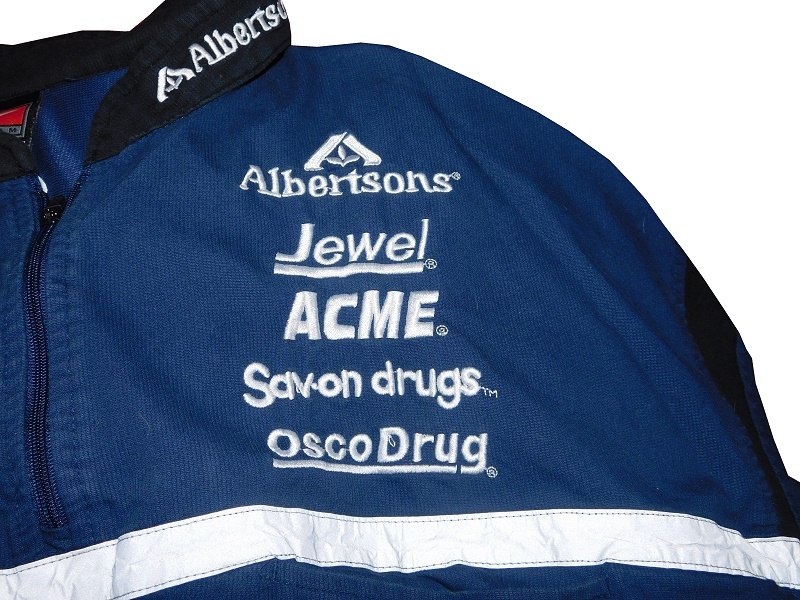 One option was asbestos, which was used in auto racing uniforms, but that led to mesothelioma. In fact, Steve McQueen claimed that the asbestos suits worn for racing gave him his mesothelioma . There seemed to be no effective solution. However, events in Florida would change everything. Nomex was created in the 1960’s for NASA. Its main use at the time was for the Apollo Command Module parachutes. NASA needed a material that could stand up to the heat of reentering the earth’s atmosphere, and still remain fully functional. While parachutes were a good use for Nomex, it soon became clear that this new fire retardant cloth had many more uses. It was also used in space suits, and eventually found its way into the public, being used for fire fighters, cooking gloves, and race car uniforms. Depending on who you ask, Bill Simpson is credited with introducing Nomex to driver suits. The story goes that Simpson started making Nomex suits after learning about the material from astronaut Pete Conrad while Simpson was working as a consultant for NASA. One of the pivotal moments in the history of the suit was when Simpson had heard that a competitor had been badmouthing his products, and so, in something he said later was “the dumbest thing I have ever done,” challenged the competitor to a “burn off.” Simpson put on his suit and lit himself on fire. 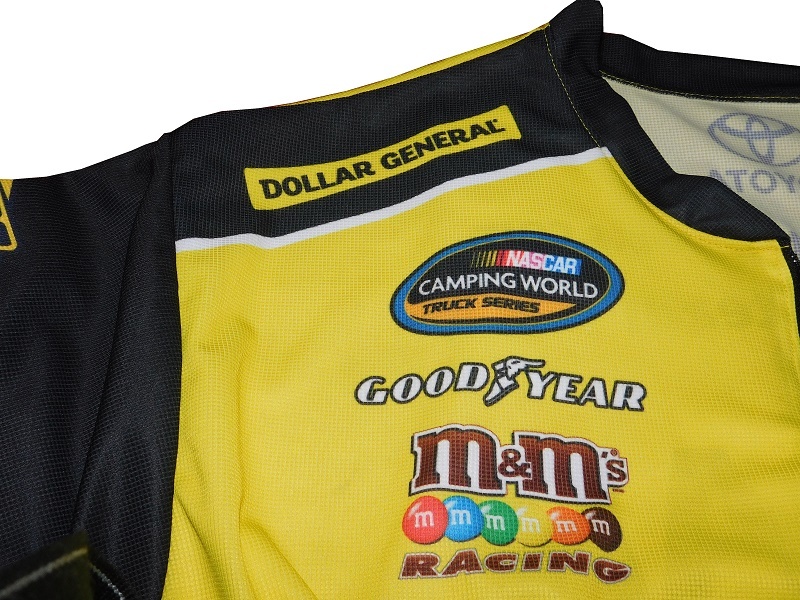 Why did it take so long to make critical changes to driver uniforms? The events that took place in 1964 were tragic, and it clearly illustrated why the old system didn’t work. 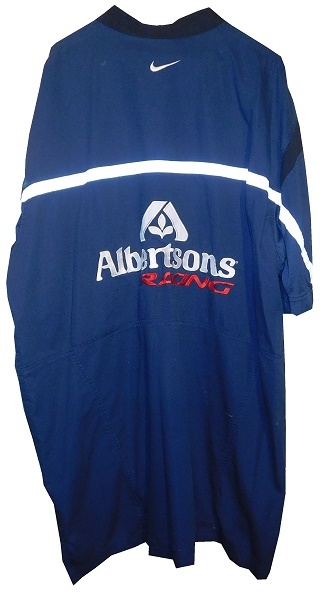 The only change made immediately after the events was the rule that fire retardant suits were now mandatory, regardless of how it made the driver feel. In today’s sports safety culture, there would be focus groups, meetings within the sanctioning body, and changes within a few months after the event. But by 1964 standards, just rigidly enforcing the rule was the best course of action, even if said materials either didn’t exist or weren’t publicly available at the time. Remember that in 1964 race car drivers were seen as somewhat expendable. Driver deaths in racing were stunningly common back then. As such, while there was a need for improvement, it was not a priority for sanctioning bodies. The sad fact is that back then, driver deaths were part of the allure of racing. People would go to these events and hope to see a fatal crash, as crass as that sounds. As for the suits themselves, the only other options besides chemical dipped cotton were asbestos suits, aluminized cotton or aluminized Kevlar, which was not more comfortable, as it was like wearing aluminum foil. There were a handful of drivers wearing Nomex suits in 1966. However, these were in more of a research and development aspect. Yes we have this new wonder material, yes it’s better than everything we have now, but will it work in a real-world situation? That was the question that existed in 1966. Competition Press reported that “During the past season, experimental driving suits were worn by Walt Hansgen, Masten Gregory, Marvin Panch and Group 44’s Bob Tullius; these four representing a fairly good cross section in the sport. The goal was to get use-test information on the comfort and laundering characteristics of Nomex. The Chrysler-Plymouth team at the recent Motor Trend 500 at Riverside also wore these suits.” The test was a success. 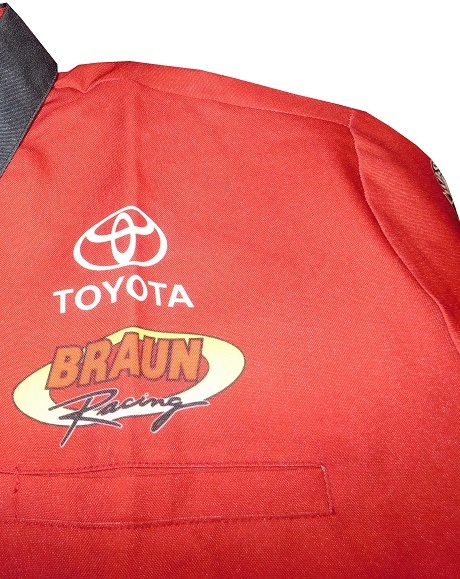 With the success of 1966, in 1967, Nomex suits were unleashed on auto racing. While more expensive, the suits were safer than anything ever seen in auto racing up to that point. The early suits seem primitive compared to the 3-layer breathable suits worn today, but even the most important uniform advancement in the history of auto racing needed a humble start. 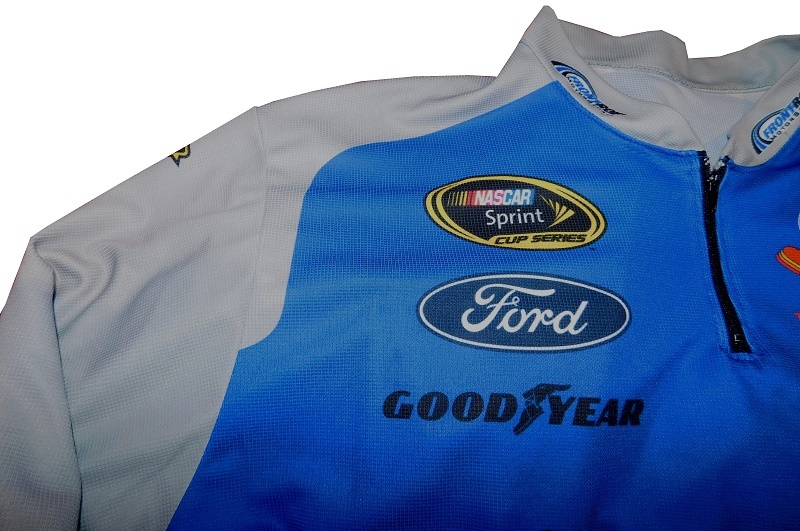 50 years after Nomex was unleashed on auto racing, it still the best material for auto racing uniforms. It says a lot about a material, when nothing better comes along to replace it for 50 years. 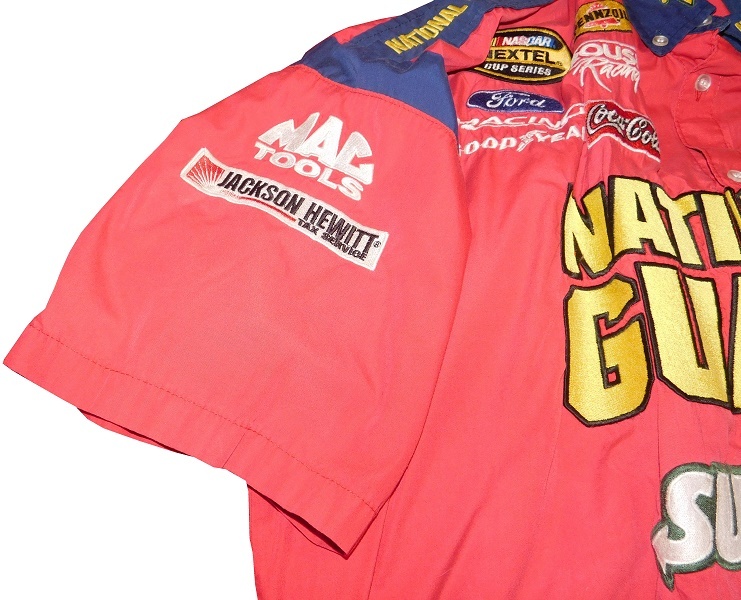 Sadly, while Nomex was one of the greatest innovations in auto racing safety, it wasn’t enough. 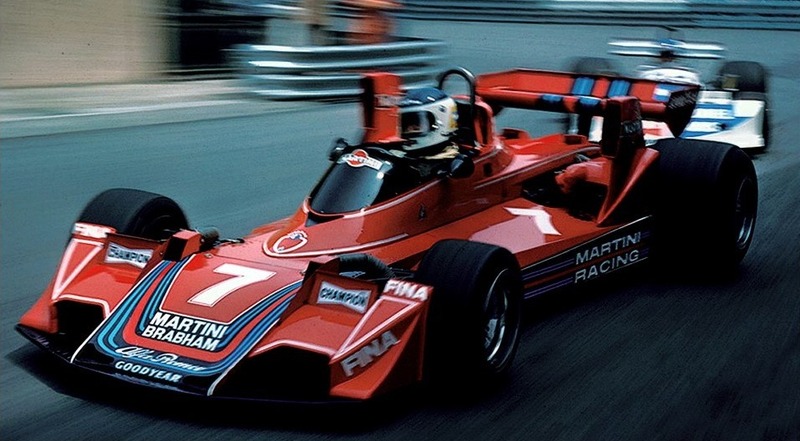 There were many other advancements, from new car design, to the HANS Device, to SAFER Barriers that has led to auto racing being as safe as it is today. The culture of the sport has changed to put safety at the top of concerns. Drivers are no longer expendable, they are the focal point of all safety changes. 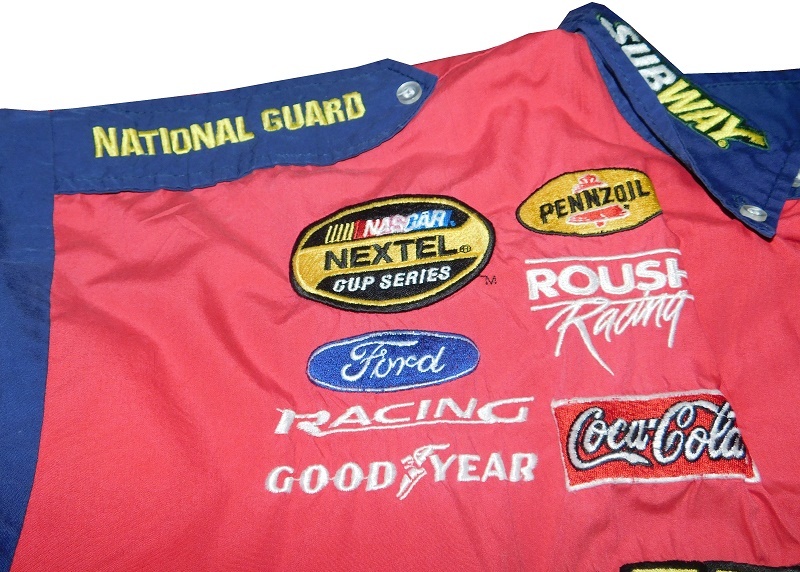 For 50 years, Nomex has been the best and most reliable material for firesuits, and I can only hope that another material comes along that is more comfortable and fire resistant than Nomex. If there is such a material, and it makes it way to auto racing, the sport will only get safer. Here’s to a good Golden Anniversary for Nomex! Trevor Bayne #6 Roush Performance Ford Fusion-Same scheme as 2016 #16, same A grade. 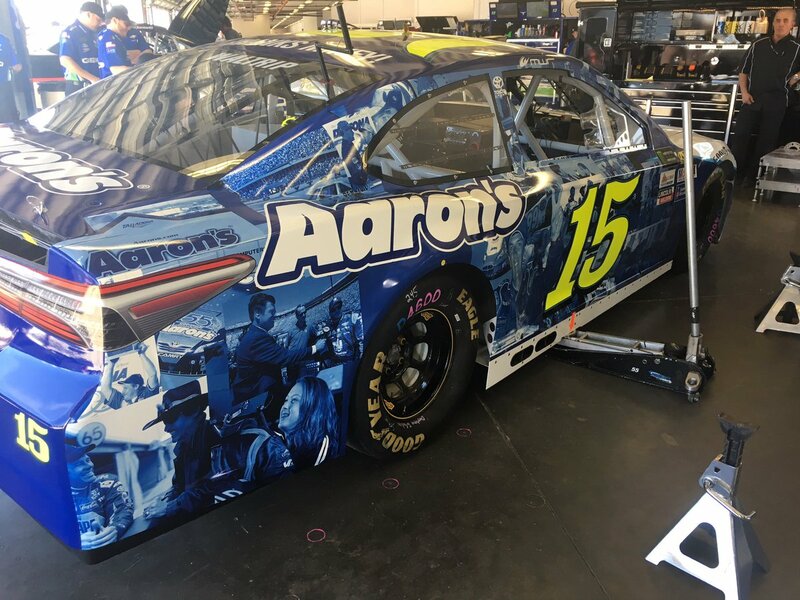 Reed Sorenson #15 Harrah’s Casino Chevy SS-It’s a smooth look, with a good color scheme, and with the silver accents removed, it still looks good. 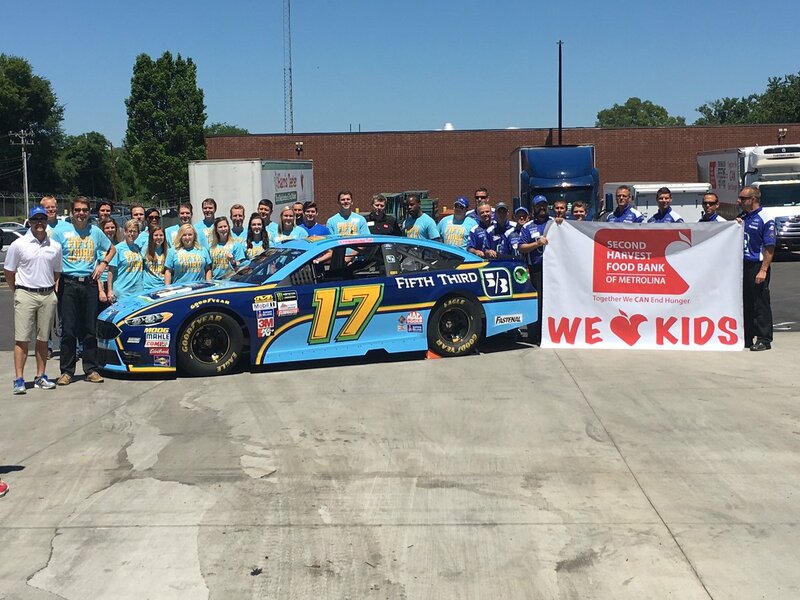 I give it an A.
Ricky Stenhouse Jr. #17 Little Hug Drinks Ford Fusion-It’s an over designed mess, with a bad color scheme. 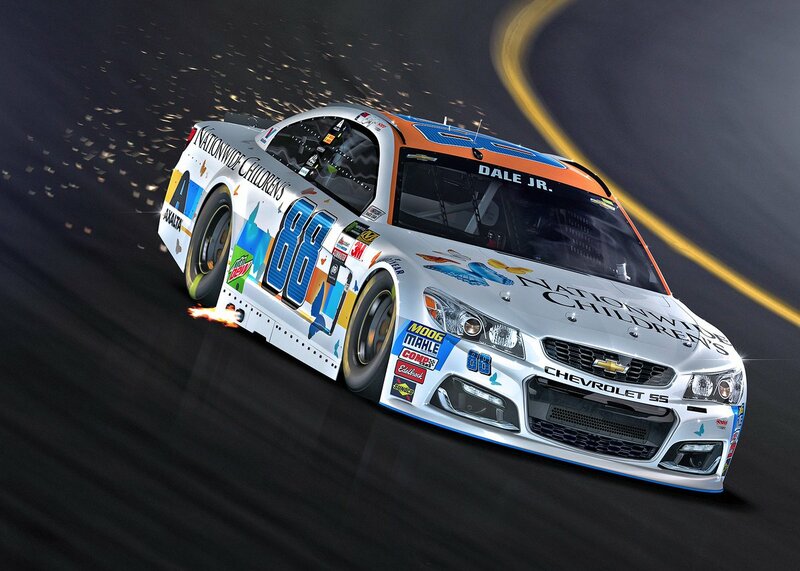 It reminds me of the old Dale Earnhardt Peter Max scheme from 2000, and that is not a comparrosn I should make. It gets an F, and I’m being generous! Kyle Busch #18 M&M’s/Red Nose Day Toyota Camry-Same scheme as last year,same A grade. Landon Cassill #34 A&W Ford Fusion-Same scheme as last year, same A grade. David Ragan #38 Overton’s Ford Fusion-The darker blue with a cloud motif works very well, and the car isn’t overdone. I don’t know why I like sky motifs on race cars, but I do. I give it an A.
AJ Allmendnger #47 Dillon’s Chevy SS-Same scheme as Kroger’s, same A grade. Timmy Hill #51 Lilly Trucking Chevy SS-A white car with white door numbers can be an iffy prospect, but this scheme pulls it off well. The stripe design on the sides needs some work, but it isn’t horrible. 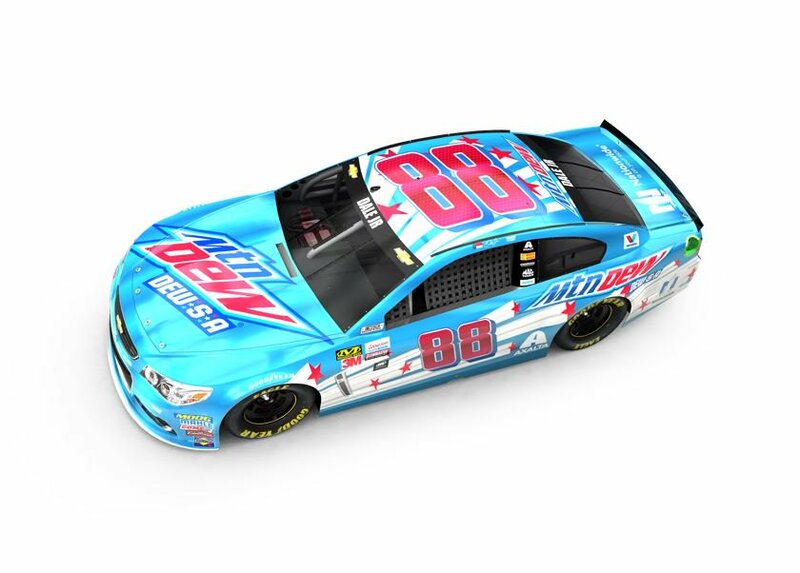 All things considered, this scheme gets a B+. Carl Long #66 Poker Palace Chevy SS-Carl just can’t catch a break. 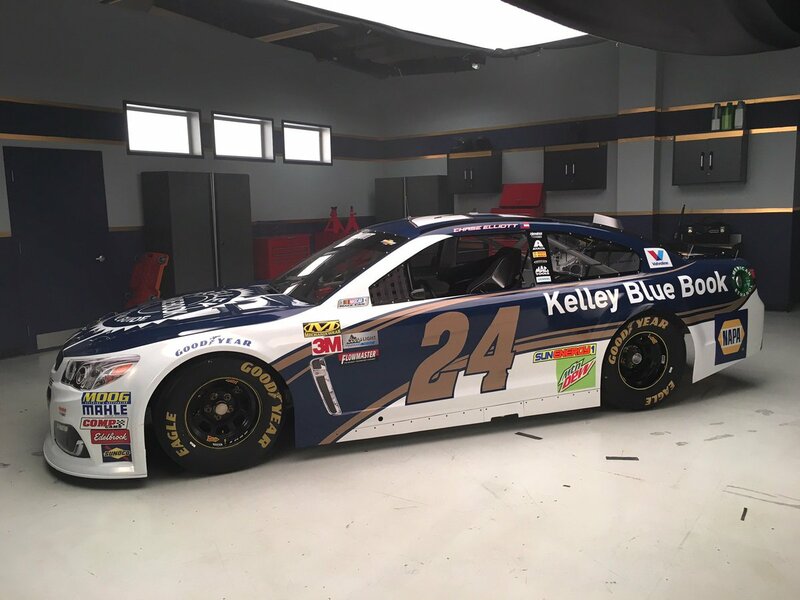 For the first time since 2009, Carl is running in the Cup series, and NASCAR tells him he can’t run his hood sponsor due to it being Marijuana related. Even if the logo was present, it’s still and ugly design, with a bad shade of green, and a otherwise awful color scheme. Still, I’ll give him some pity, and give him a D-. 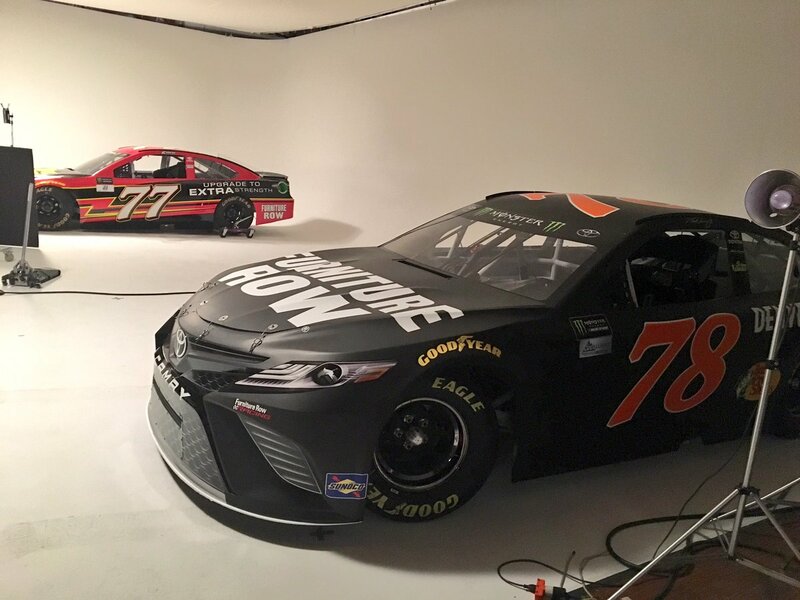 Cole Whitt #72 Bad Boy Mowers Chevy SS-The black works, the orange doesn’t and the cutting edge design is meh at best. All thing totalled, I give this a C-. Michael McDowell #95 Tommy Williams Drywall Chevy SS-The drywall motif works very well, with a great color scheme to boot. It’s an all around attractive car. I give it an A.
I’m not a fashionista…and that’s putting it lightly. I wear my work uniform to work, and when I’m off duty, I wear t-shirts, and shorts, especially while lounging around the house. 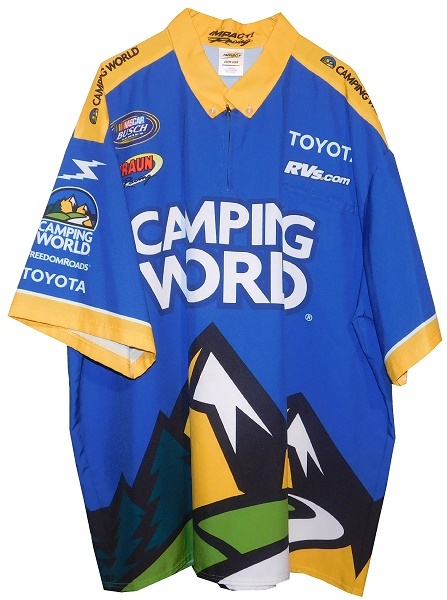 When I go out with friends and/or family, or when I go to races, I will wear pit crew shirts. I will pair these with baseball stirrups, shorts, and a baseball cap. Pit crews are proud of what they do. 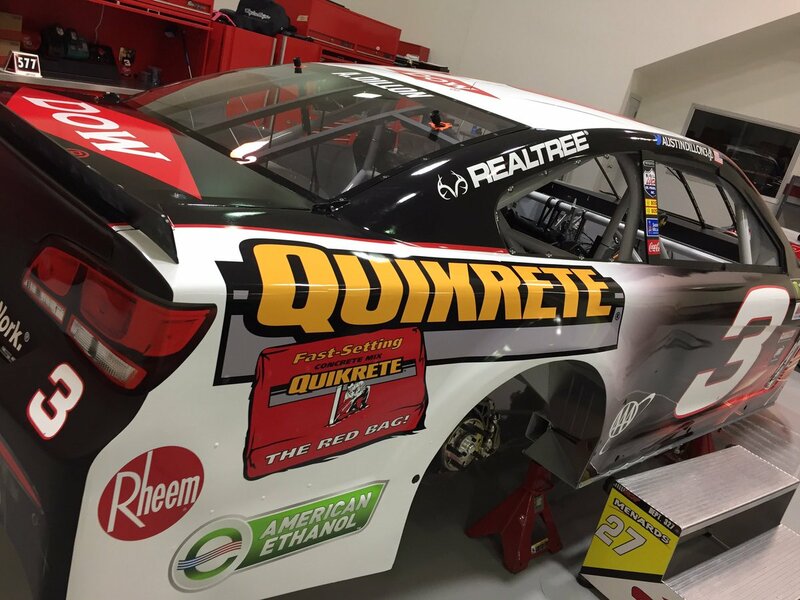 They get to work on race cars for a living, which many fans would love to do. 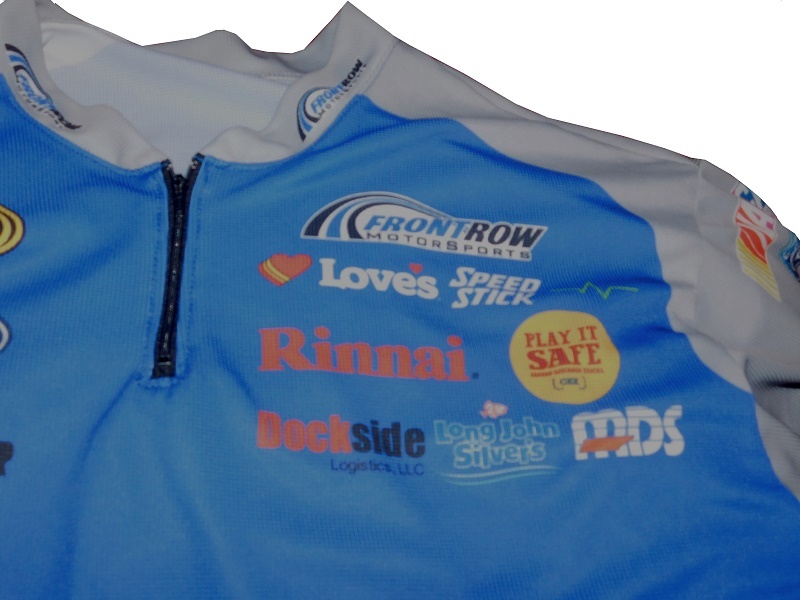 Sponsors are proud of their race teams, and want their crew members to represent the brand. 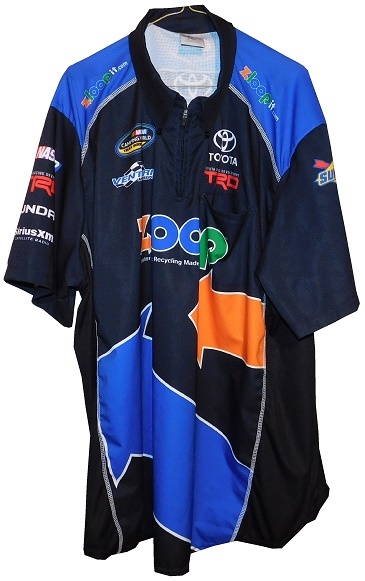 As a result, teams and sponsors create pit crew shirts. 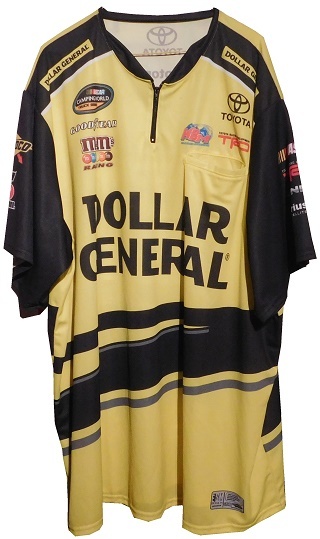 These shirts are designed similar to the driver suits. 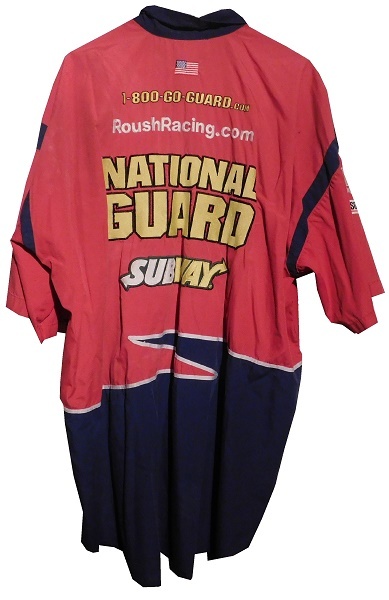 Like driver suits, they are sold to collectors after the season. These aren’t as valuable as other race-used memorabilia, and while some collect them, others, like me wear them. 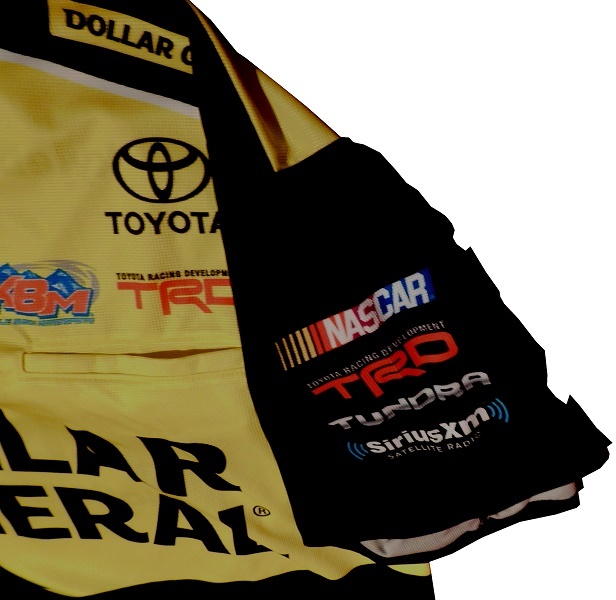 There are many kinds of materials that pit crew shirts are made of. 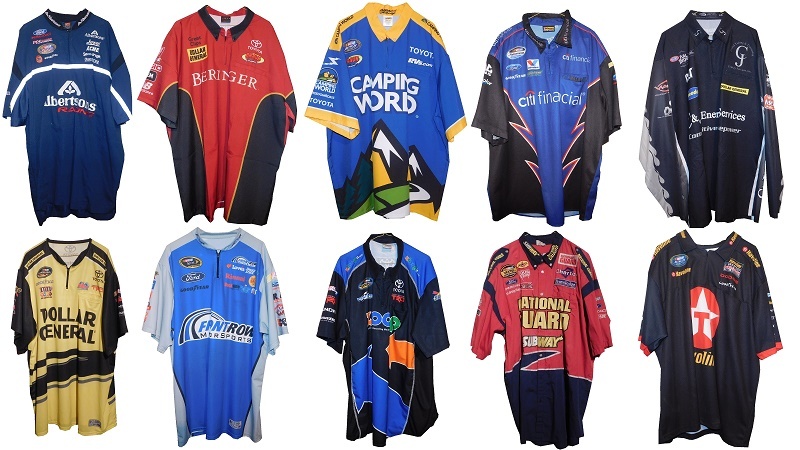 Some of the older ones are made of polyester with heavy patches. 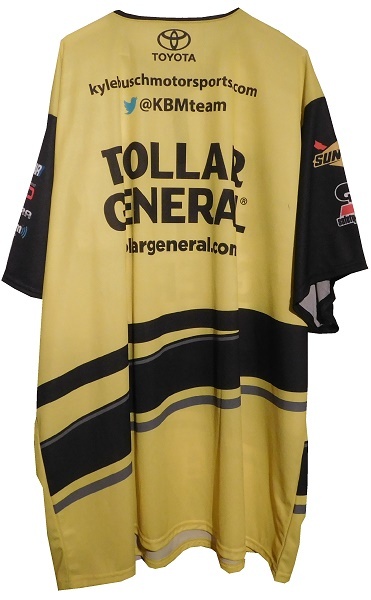 Then there are newer shirts that are made of a light, breathable materials, with the logo sublimated on the material, like this 6Xl Dollar General Truck Series shirt. 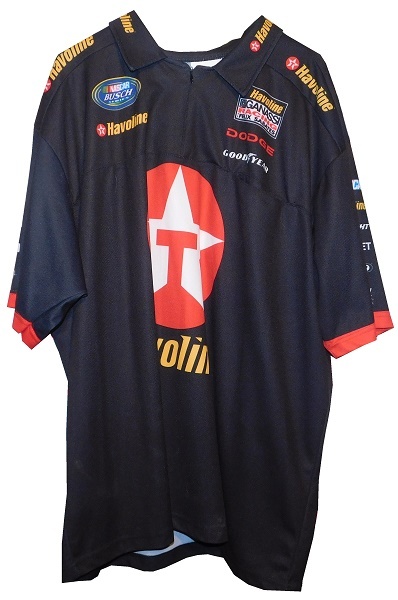 The shirt shows some light wear, but is in great condition. 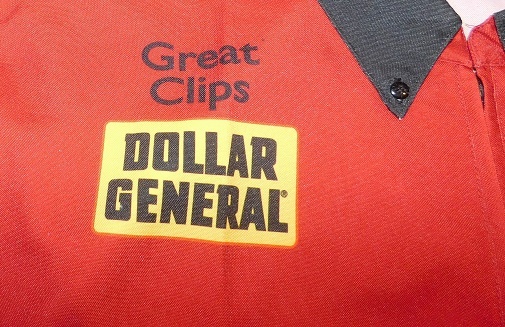 The shoulders have epaulets with DOLLAR GENERAL logos present. 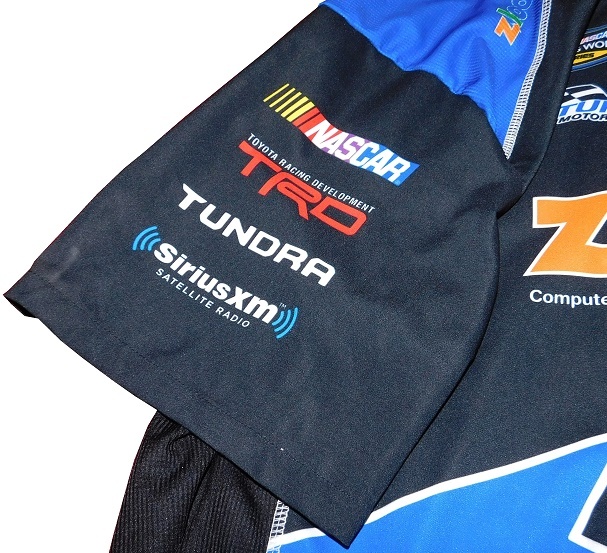 The sleeves have logos, the right sleeve has SUNOCO and SAFETY KLEEN, the left has NASCAR, TOYOTA RACING DEVELOPENT, TUNDRA, and SIRIUS XM logos. This is one of the newer shirts, and it has a jocktag. 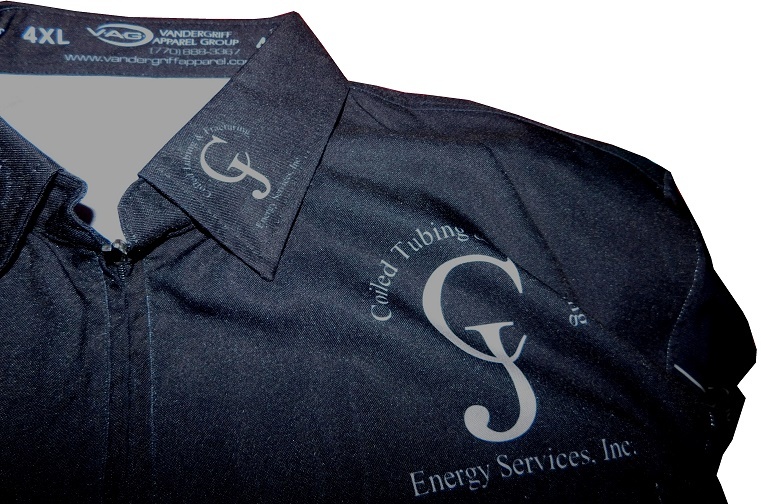 The shirt was made by ESM of Indianapolis. 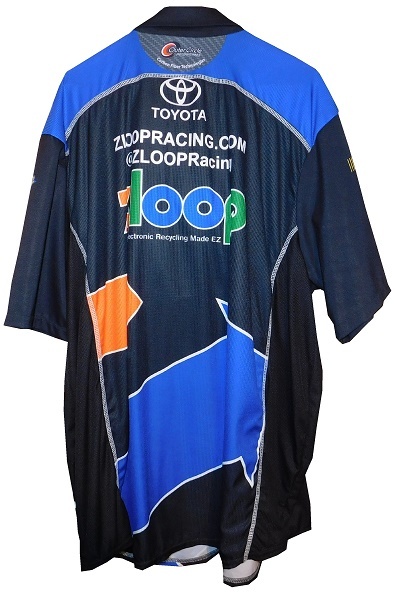 Sticking with the Camping World Truck Series, this 6Xl shirt was worn by the crew from Venturini Racing, when they were sponsored by ZloopIt in 2014. 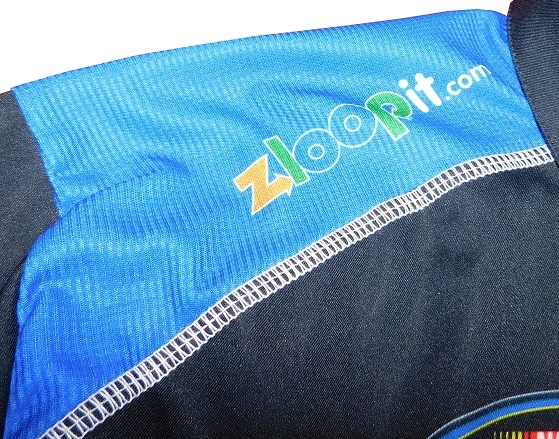 It has a combo of thin polyester, and breathable mesh. It is in great condition. 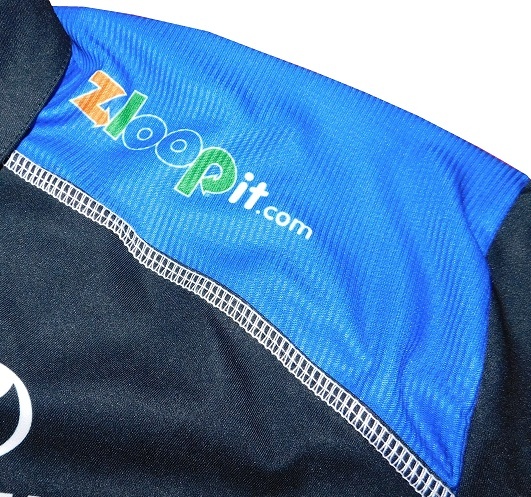 The shirt has blue epaulets on the black material, and the epaulets have ZloopIt logos. 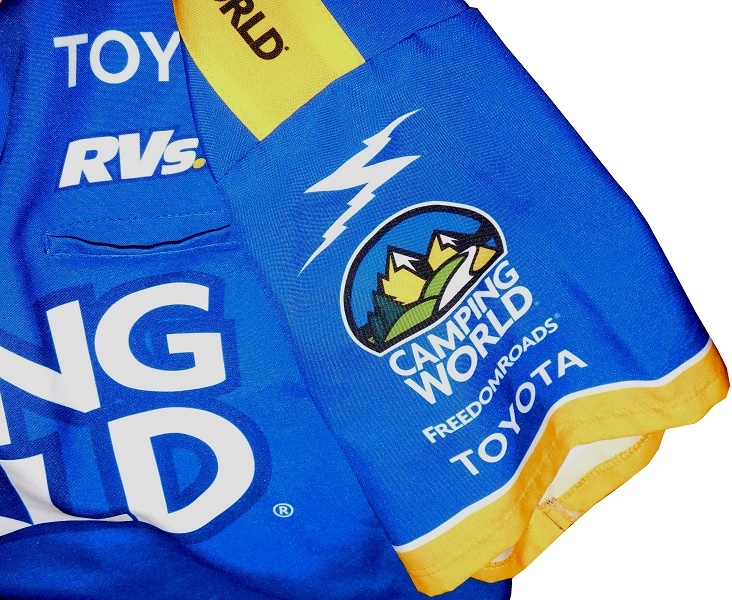 The sleeves have logos, the right sleeve has NASCAR, TOYOTA RACING DEVELOPENT, TUNDRA, and SIRIUS XM logos, and the left sleeve has a SUNOCO logo. 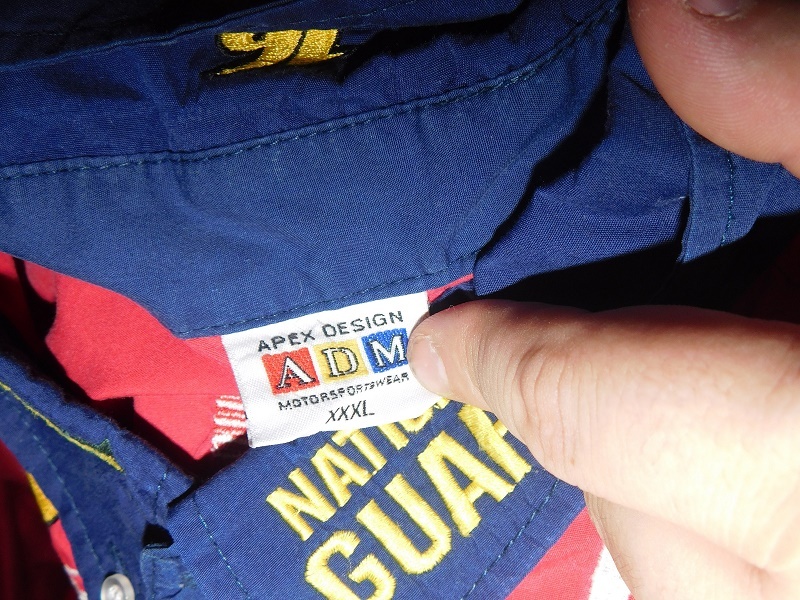 There is an Outer Circle tag in the cowl, indicating that the size is 6XL. 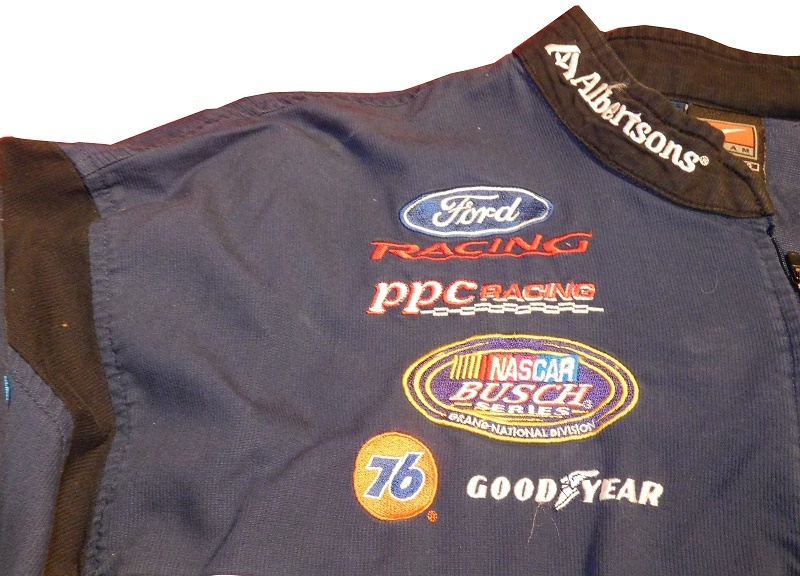 Moving on to the Xfinity Series, this is a Nike-made example from when PPI Racing was sponsored by Albertson’s. It is in great condition. 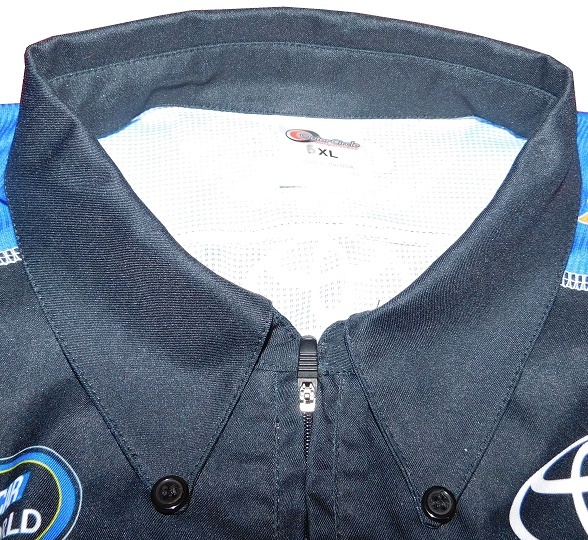 The shoulders have no adornment at all, the chest logos are all embroidered. 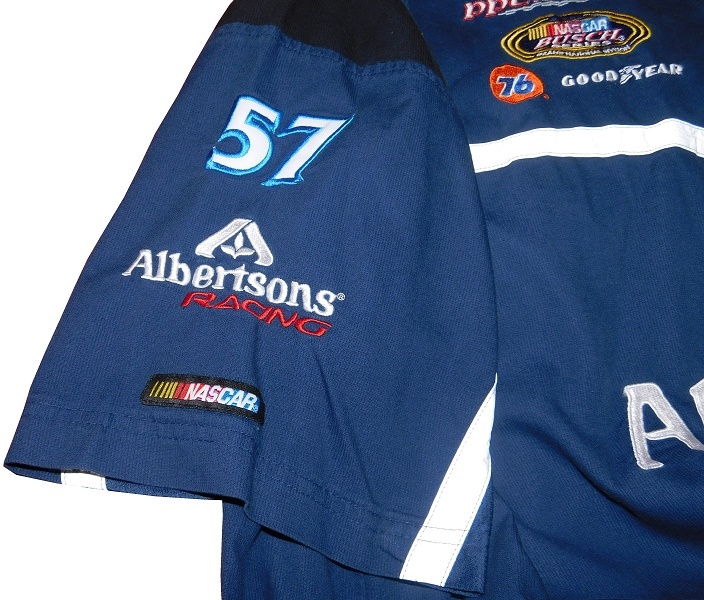 The sleeves have patches, the right one has a 57 patch, an ALBERTSONS logo, and a NASCAR logo. 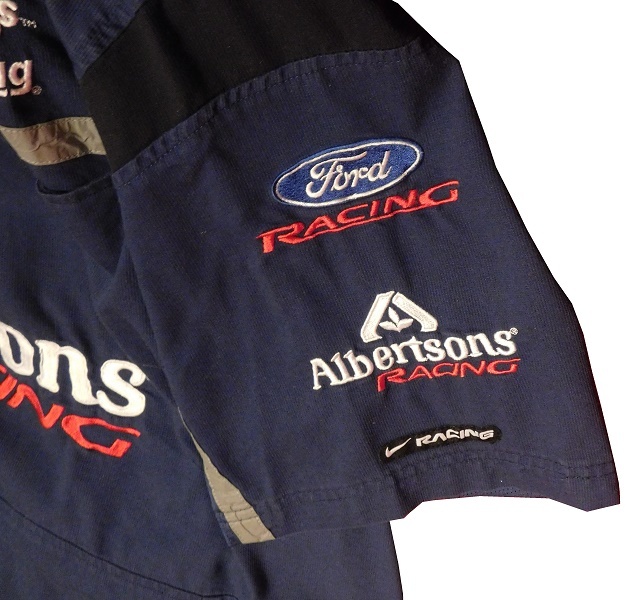 The left sleeve has a FORD logo, an ALBERTSONS logo, and a NIKE logo. 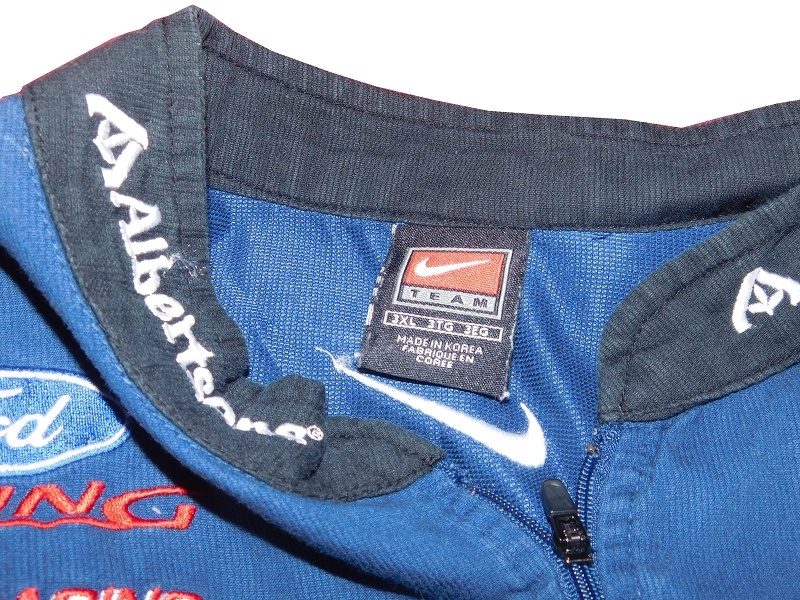 The cowl has a classic Nike 3Xl tag present. 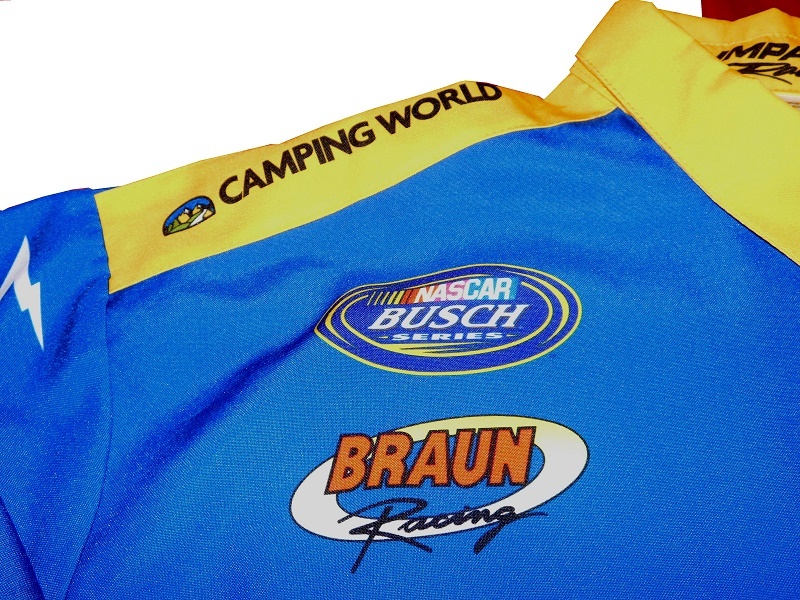 This example, from when John Andretti raced for Braun Racing, with Camping World as a sponsor. 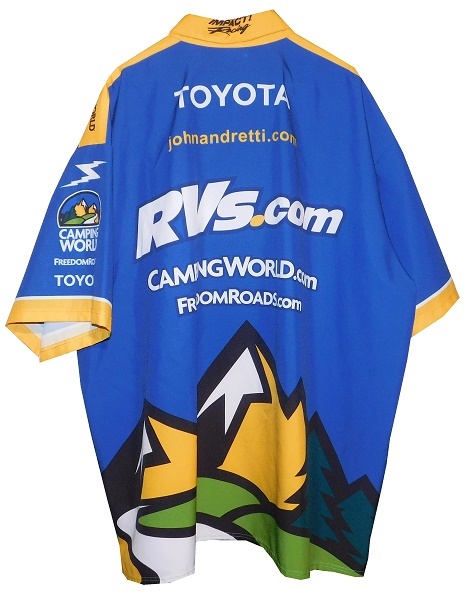 The shirt is made from a slightly thicker polyester with sublimated logos. It’s in great condition. 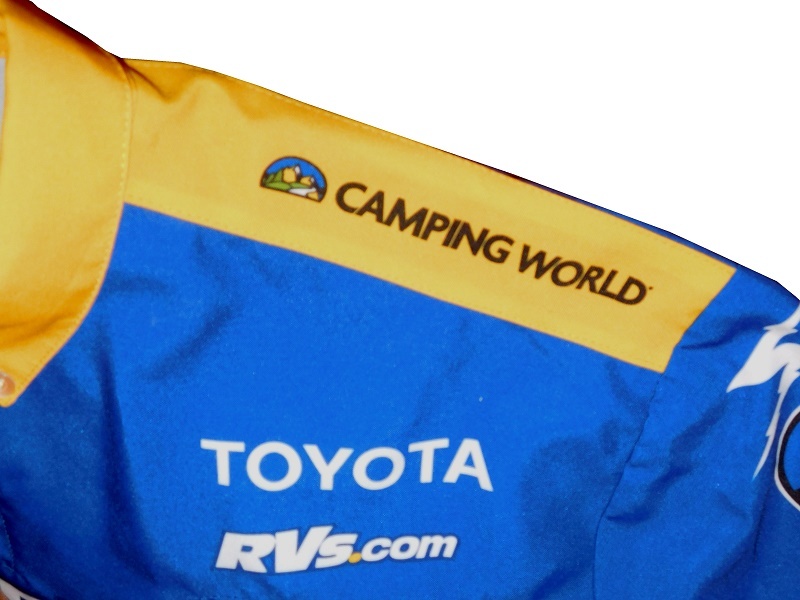 The blue shirt has yellow epaulets, with CAMPING WORLD logos present. 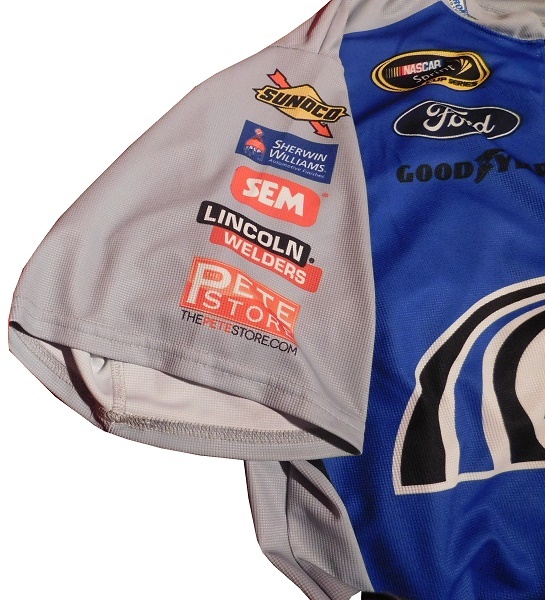 The sleeves have the same set of logos on each side. 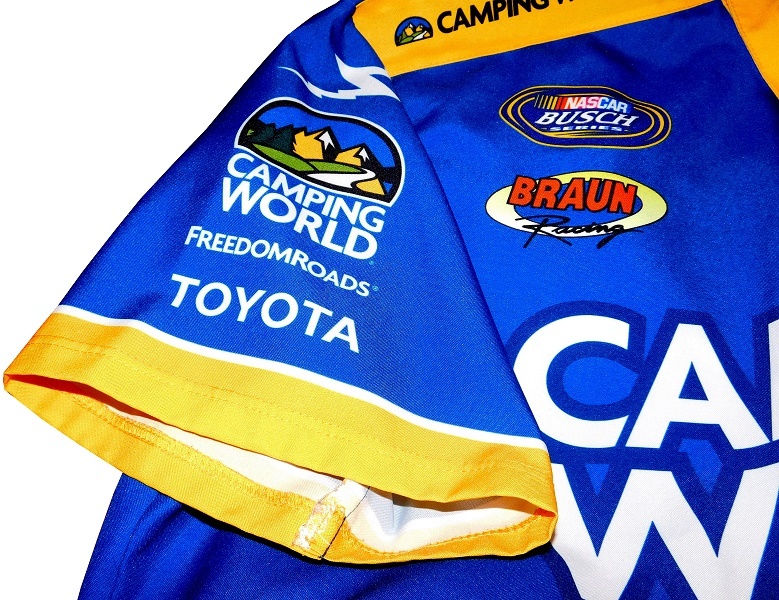 First is the Impact Z logo, then there is a CAMPING WORLD logo, followed by a FREEDOM ROADS, and a TOYOTA. 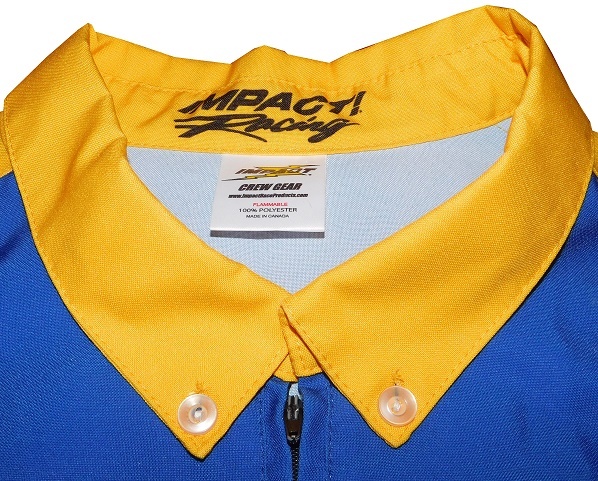 The cowl features an Impact crew tag, no size tag is present. 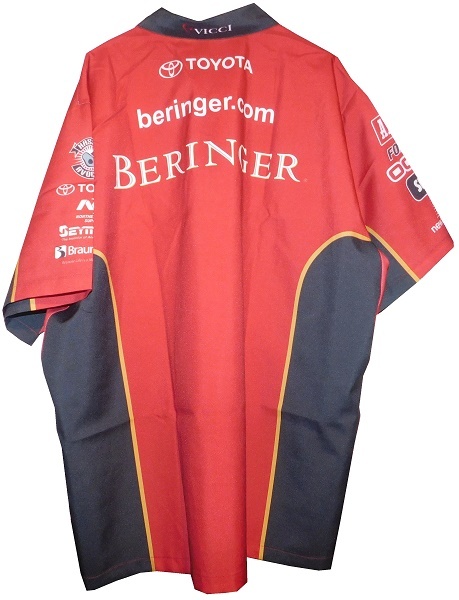 Sticking with Braun Racing in the Xfinity Series, this Berringer Wines pit crew shirt comes from that team as well. This is also a thicker polyester in great condition. 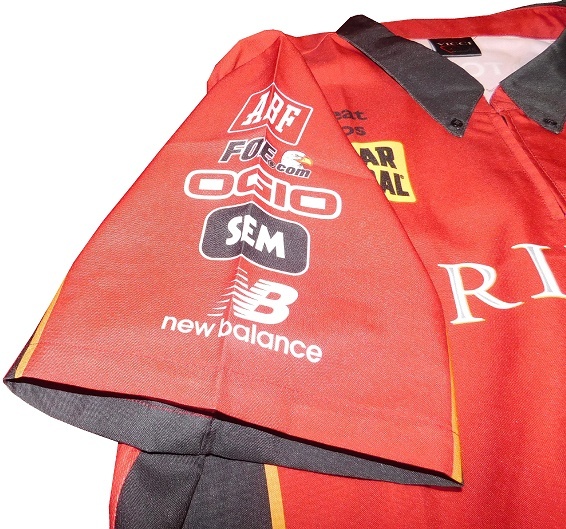 The shoulders have no epaulets, or adornment, and the logos are sublimated. 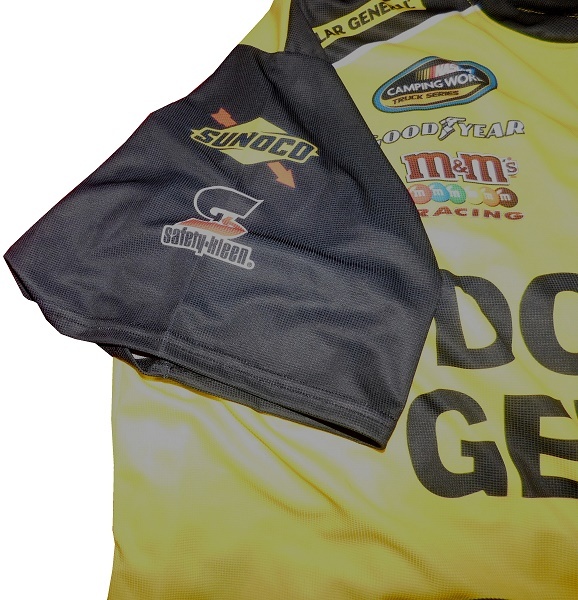 The sleeves have sublimated logos. The right sleeve has ABF, FOE, OGIO, SEM, and NEW BALLANCE logos. 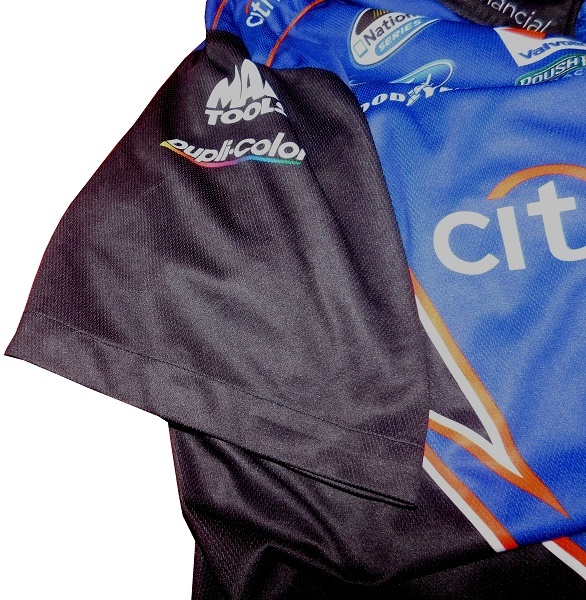 The left sleeve has HAAS AVOCADOS, TOYOTA, NORTHEASTERN SUPPLY, SEYMOUR and BRAUN ABILITY logos. 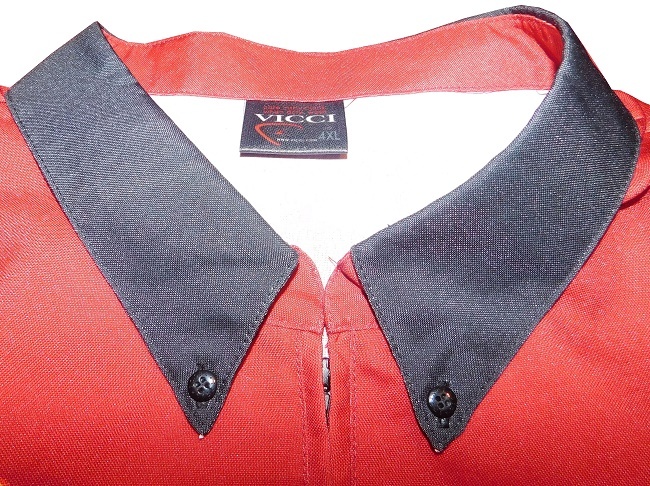 The shirt is made by Vicci, and there is a size 4XL tag in the cowl. 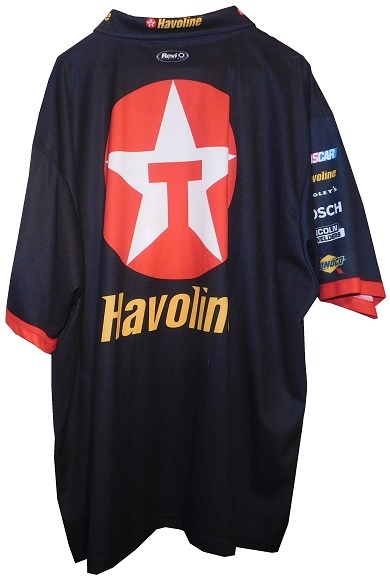 One of the best designs in pit crew shirts is Texaco Havoline, as exampled by this Juan Pablo Montoya shirt from his days with Chip Ganassi Racing. It is in great condition. 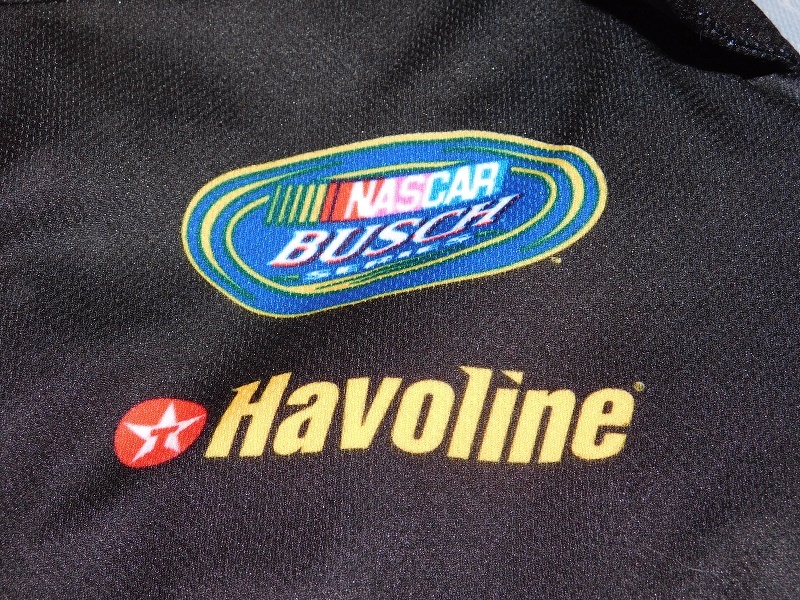 The shoulders have epaulets with HAVOLINE logos, and the chest has logos as well. 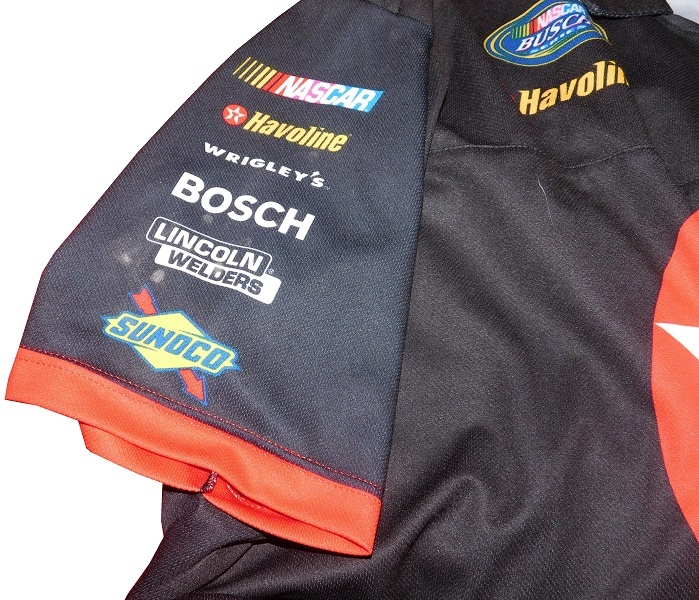 The sleeves have sublimated logos, including, NASCAR, HAVOLINE, WRIGLEY’S BOSCH, LINCOLN WELDING, and SUNOCO logos on the right sleeve. 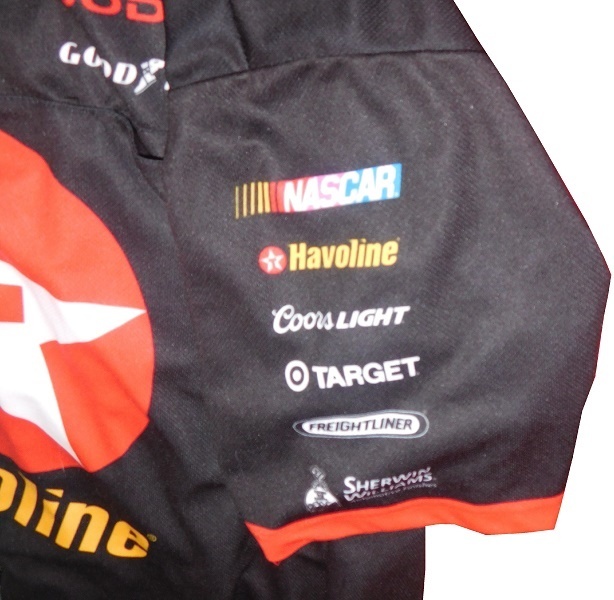 The left sleeve has NASCAR, HAVOLINE, COORS LIGHT, TARGET, FREIGHTLINER, and SHERWIN WILLIAMS Logos. 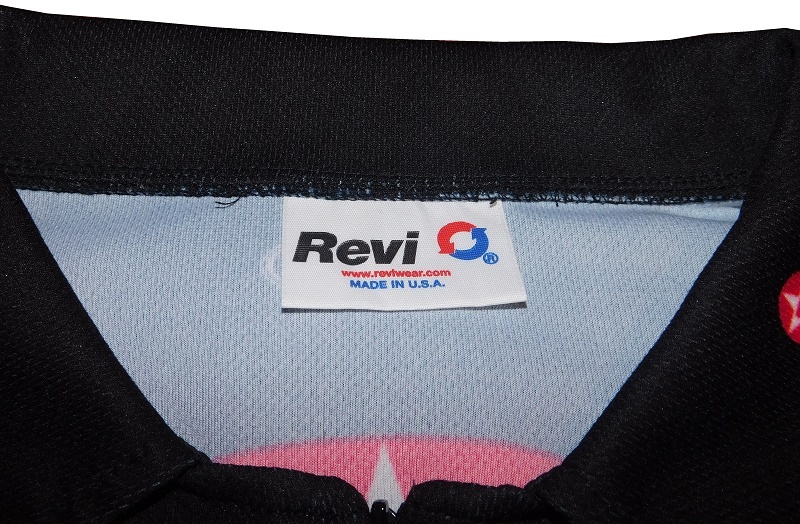 The cowl has a tag from Revi, but there is no size tag present. 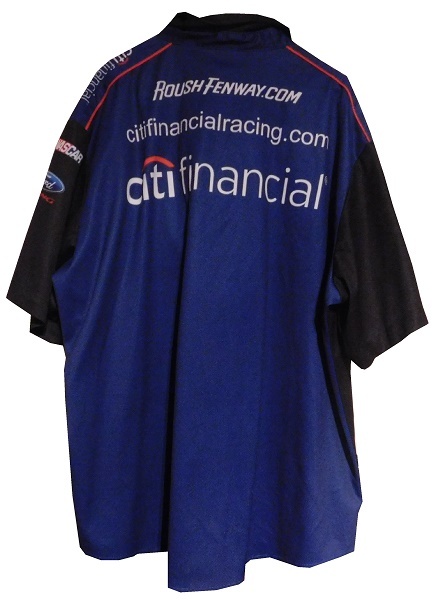 Ricky Stenhouse Jr. is a two-time Xfinity Series champion, and while with Roush-Fenway Racing, he was sponsored by CitiFinancial, and this pit crew shirt was prepared. It is in decent condition. 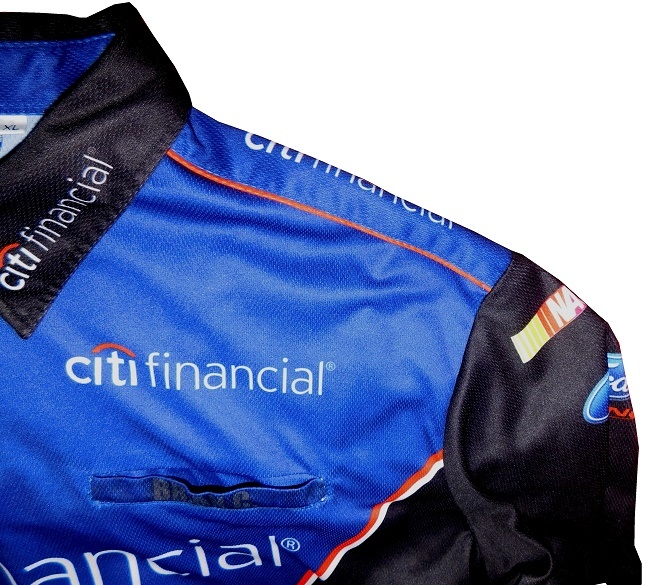 The shoulders have epaulets with CitiFinancial logos on them. The sleeves have sublimated logos. 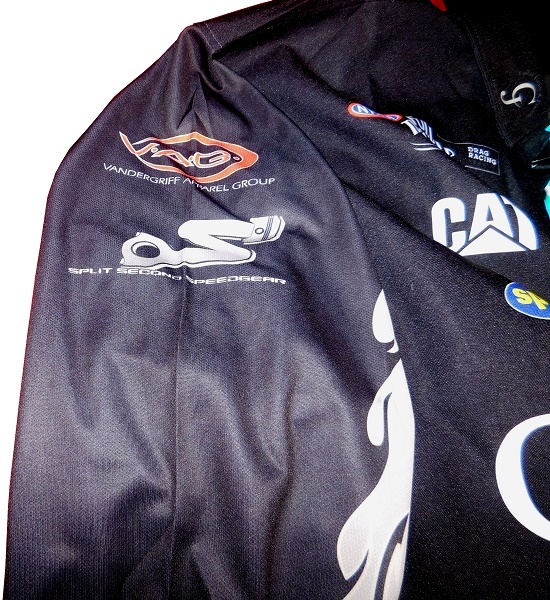 The right sleeve has a MAC TOOLS logo and a DUPLICOLOR logo. 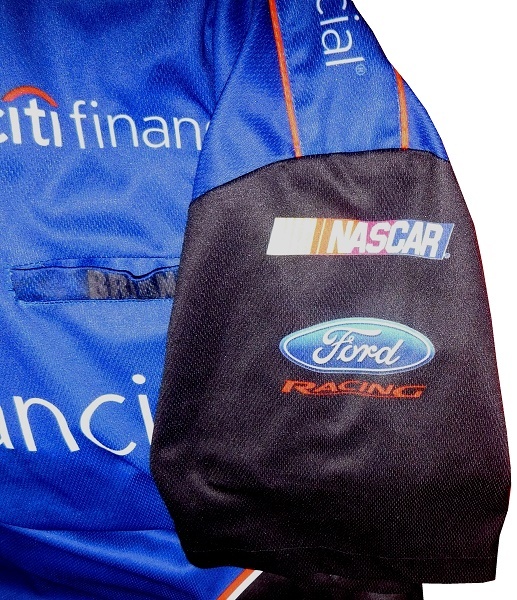 The left sleeve has a NASCAR logo and a FORD logo. 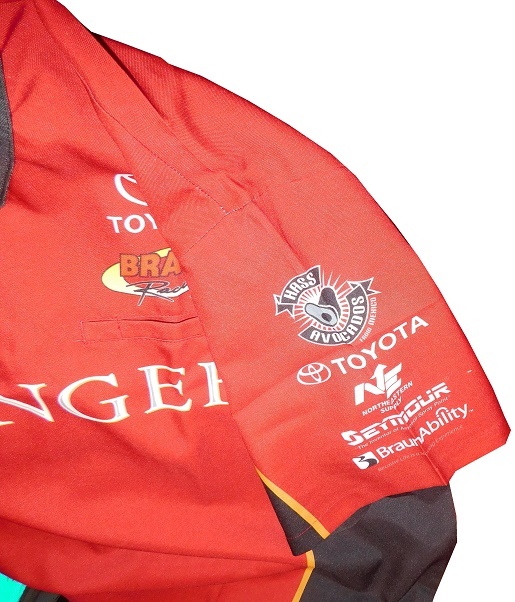 The shirt is made by The Winning Team, and a tag is present in the cowl. 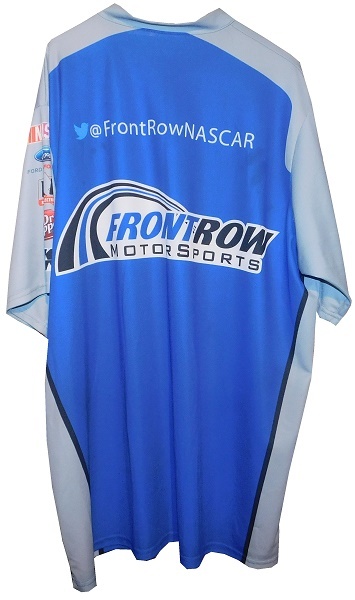 There is also a size 5Xl tag as well. 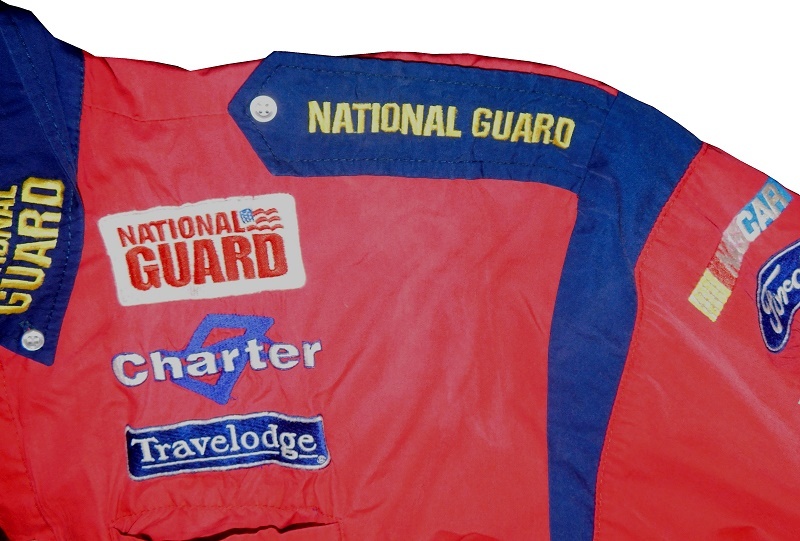 One of Greg Biffle’s sponsors in the Monster Energy NASCAR Cup Series was the National Guard. This shirt, made of dress shirt material, with heavy patches. The shoulders have epaulets with NATIONAL GUARD logos embroidered into them. 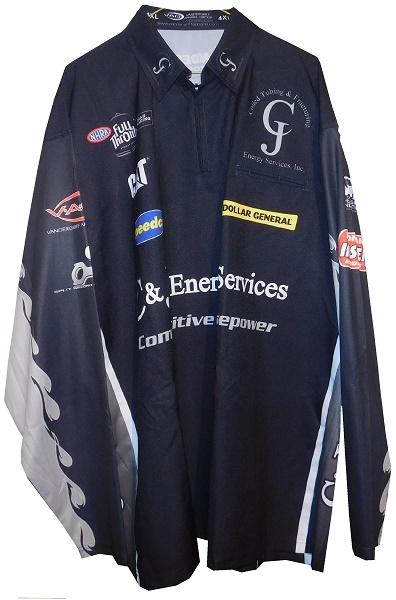 The right sleeve has MAC TOOLS and JACKSON HEWITT logos, and the left sleeve has NASCAR, FORD RACING, and LABOR READY logos embroidered into it. The cowl has a tag from Apex designs, and size XXXL tag. 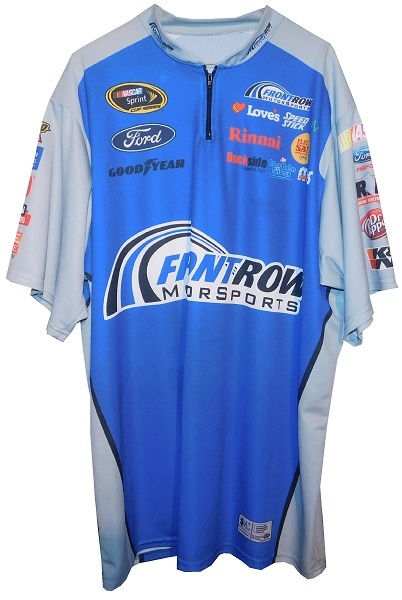 Front Row Motorsports has a few different sponsors, so, like many teams, they have team-branded pit crew shirts. This is one example, and it’s in great condition. The shoulders have unadorned epaulets. The sleeves have sublimated logos. 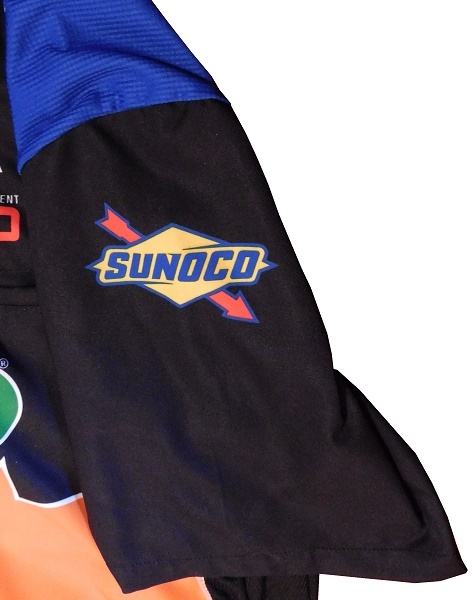 The right sleeve has SUNOCO, SHERWIN WILLIAMS, SEM, LINCOLN WELDERS, and THE PETE STORE logos. 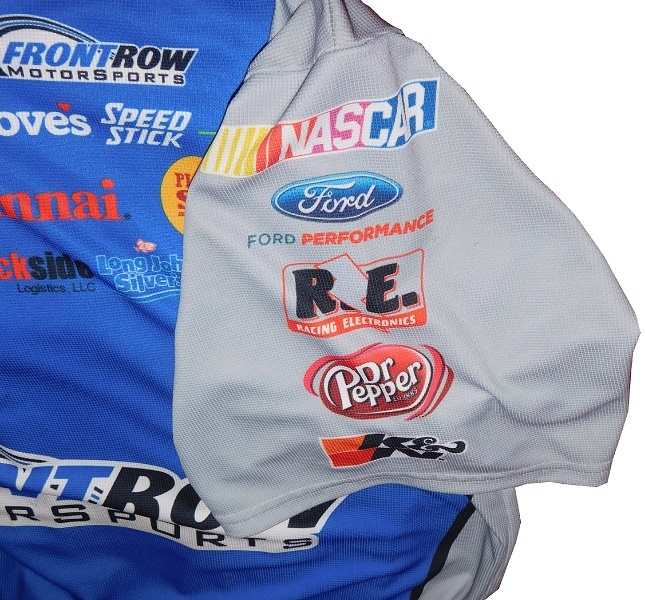 The left sleeve has NASCAR, FORD PERFORMANCE, RACING ELECTRONICS, DR PEPPER, and K&N logos present. This is one of the newer shirts, and it has a size 3XL jocktag. 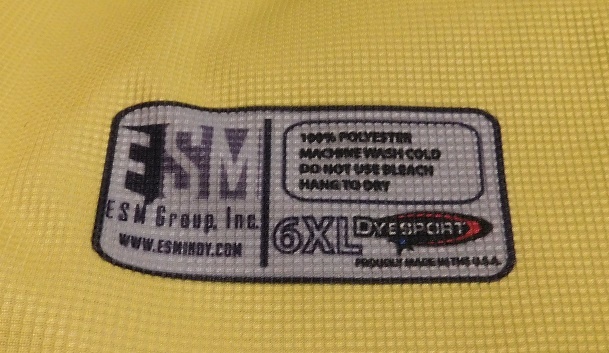 The shirt was made by ESM of Indianapolis. Bob Vandergriff is a former driver who turned into a team owner. 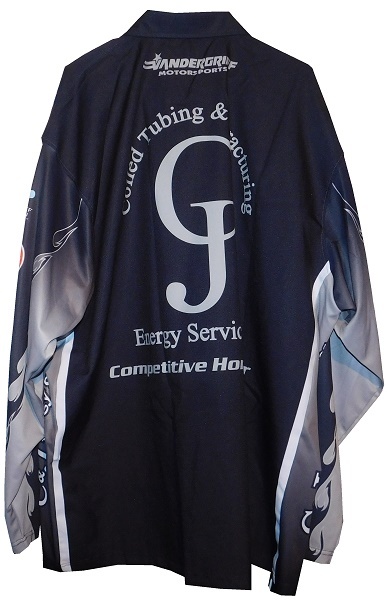 For many years, he was sponsored by CJ Energy Services, This long-sleeve pit shirt was prepared for a crew member. 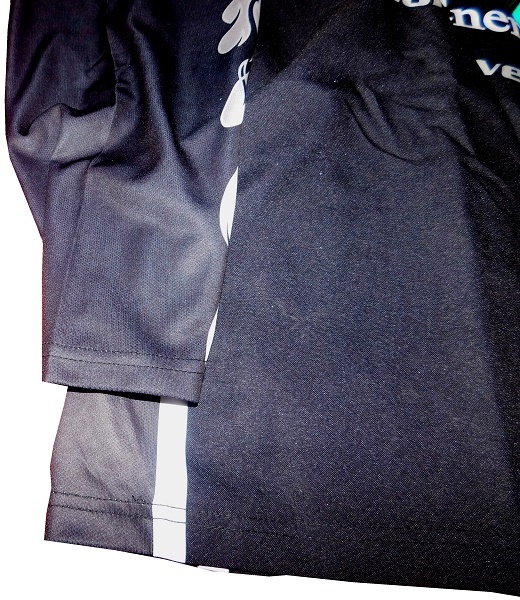 The sleeves are a thin polyester, the rest of the shirt is a thicker material. The shoulders are completely unadorned. 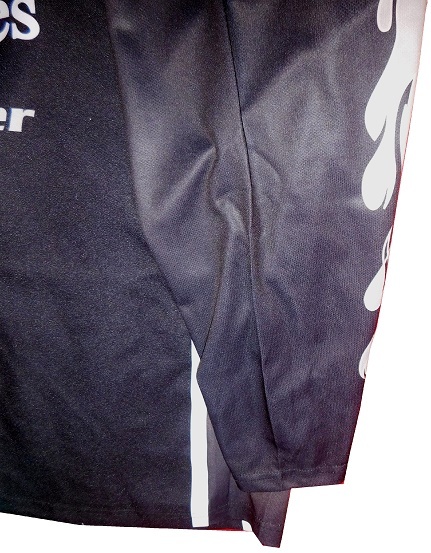 The sleeves have black on the outside, but gray flame materials on the undersides. 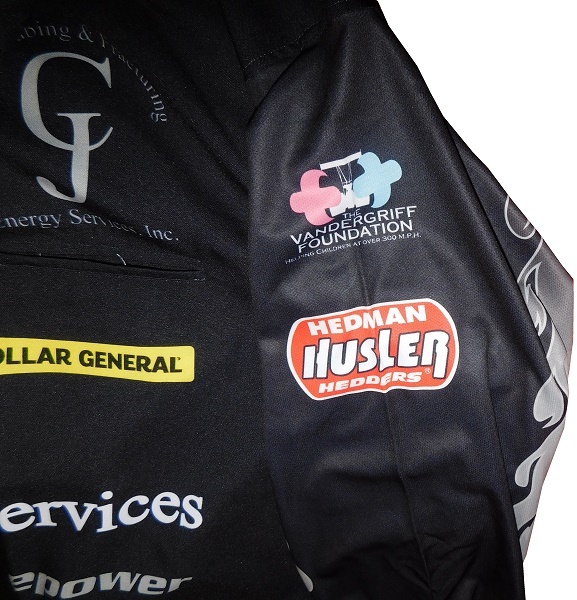 The right sleeve has VANDERGRIFF APPAREL GROUP and SPLIT SECOND SPEEDSTERS logos The left sleeve has THE VANDERGRIFF FOUNDATION, and HEDMAN HUSLER HEDDERS logos. 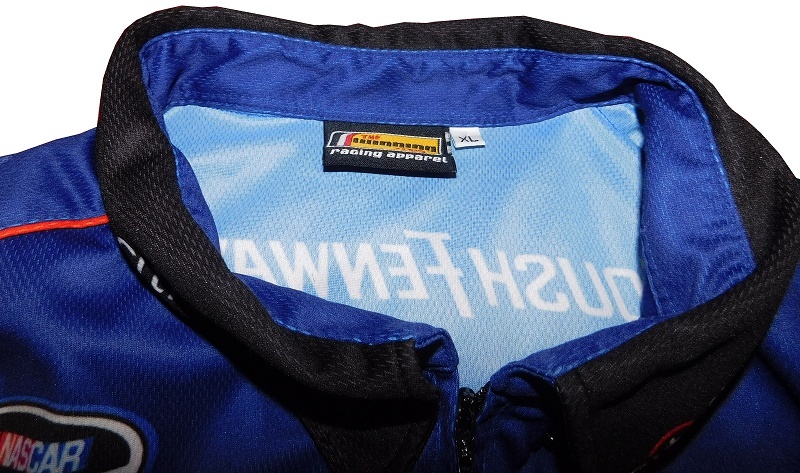 The Vandergriff Apparel tag is printed directly on to the back of the collar. It indicates the size as 4XL. 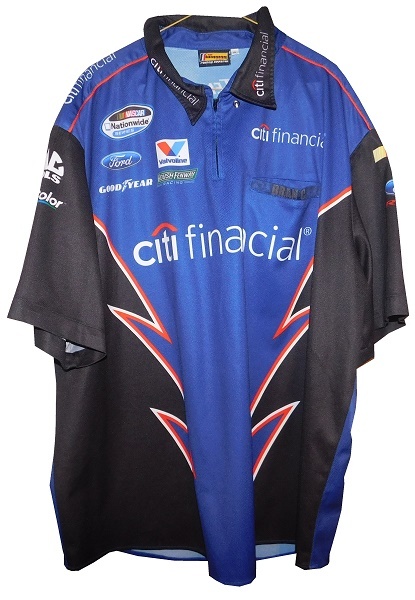 The fan appeal of pit crew shirts hasn’t been lost on teams, and there have been replica shirts made in the past. 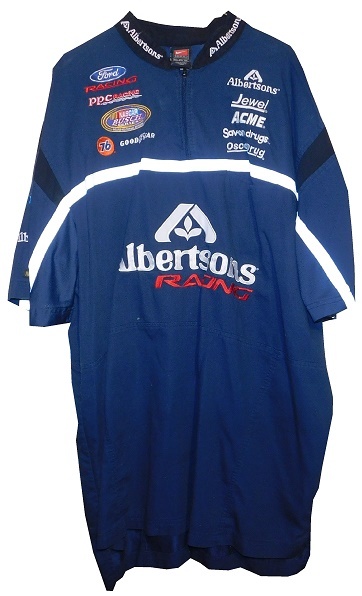 But for some seasons, replica crew shirts are made, but other seasons, they aren’t. 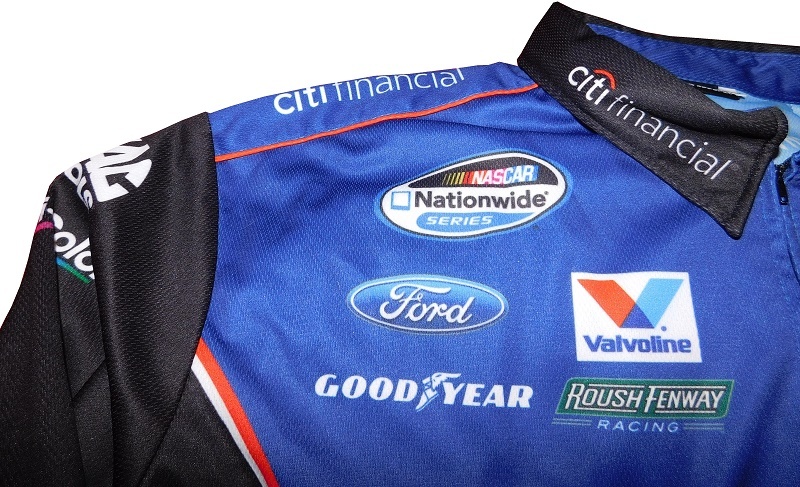 Fans do like these, but for some reason, they are not as prevalent as replica driver suit jackets. I can only hope that these shirts do start getting made again. Next week, we discuss the 50th Anniversary of the introductory of Nomex.